If you are looking for Ron Schnell's c.v., it is here. If you are looking for Ron Schnell's home page, it is here. The people of Driver Aces have been involved in UNIX development for 27 years, and have been Arpanet/Internet denizens since 1978. 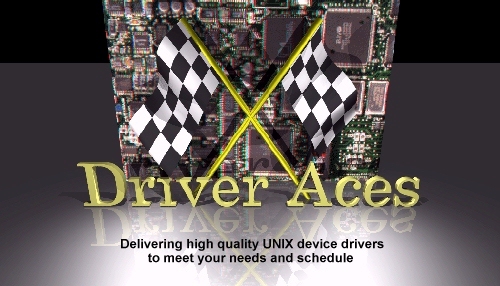 Driver Aces, Inc. specializes in authoring UNIX device drivers on a fixed-price basis. We also provide custom kernel modifications, bug fixes, and custom filesystem types for security and performance enhancements. Our system programming services can also meet your large scale application needs. If you would like to see something we have written, Murdoch University has allowed us to distribute, for free, the ipctl package, which was developed by us, and sponsored by them. Sorry, we don't stock pre-written drivers. We only write or adapt drivers to order, after which the drivers become the property of our clients. © 1996 Driver Aces, Inc.